Visiting the renowned Golden Triangle is a must to complete the trip to Chiang Rai province! 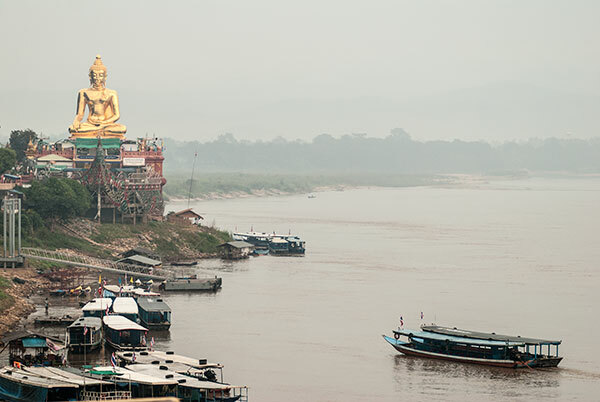 This is the famous location where the borders of Thailand, Laos, and Myanmar meet in the middle of the Mekong River. The Golden Triangle was formerly known as the world’s major producer of opium but now, totally drug-free, a popular tourist attraction known for picturesque views. Reaching the Golden Triangle where Thailand, Laos, and Myanmar join is easy as it’s only 9 kilometers north of Chiang Saen, by taking the road parallel to the Mekong River. “Sop Ruak” is its nickname called by the locals, representing it is where Mekong and Ruak rivers join. It is also the birthplace of various legends of the Lanna culture. Boats services are available to enjoy the view upstream of the Golden Triangle and to cruise downstream to Chiang Khong. The journey to the Golden Triangle would take about 40 minutes and 1 hour is required to travel to Chiang Khong. Please be noted that the time duration may vary depending on river currents and water levels.